Muneeyd Aleas, left, with Maluz Bazquez planting in the garden. April showers portend to pepper the month's last Saturday morning, but the bobbing shock of silver hair leading me briskly through a wooded path shows no signs of slowing. When Pastor Nina Wynn asks you to walk and talk, you better follow. "I'm just going to be the annoying white woman today," she says, "but it's OK, I'm used to that." Our trek takes us to an apartment complex, home to an array of immigrants and refugees, located behind St. John's United Methodist church on Monroe Road. Wynn and I weave and zip between the buildings, trying to rally troops for our cause. SheCan Charlotte, a micro-business initiative seeking to encourage independence among the city's immigrant women, launched mere days before and is in need of participants. Centered on the concept of urban homesteading, SheCan is the brainchild of Susana Jerez, who first got the idea when she was the director of the Immigrant Welcome Center at the Latin American Coalition. While there, she oversaw the resource center, which provides services to people in some kind of crisis. "In that environment, you start seeing people without choices, and you see how disenfranchised women in particular are," Jerez says. "The most disenfranchised of our immigrant women are the illiterate women; they have the least options and choices." While cycling through a series of ideas, Jerez became aware of Grameen America, a microfinance nonprofit dedicated to lifting low-income people out of poverty through entrepreneurship. A self-described "farmer-style person," Jerez decided to take her passion for promoting environmental awareness in her own family a step further and applied for a microloan to build a food preparation-oriented business, based on a co-op structure, where immigrant women would be in charge of growing, picking and selling what they produce. Visions of gardens dancing in her head, she quit her job and joined forces with longtime friend and former mortgage loan officer Leonor Rico. After reaching out to Wynn to secure space for a community garden, the blueprint for SheCan was born. It works like this: On Saturdays between 9 a.m. and noon, Jerez and Rico host an event at St. John's divided into three lessons, based on ESL, financial literacy and homesteading. When Wynn and I return from our enlistment attempts — which produced participants for future meetings, just not for this, SheCan's second meeting — we find seven women gathered around a table who had come of their own accord. The women have finished the ESL lesson and are halfway through the financial-literacy class, led by Rico. Rico worked in banking for more than 10 years, and it was there that she noticed how many immigrant women lacked the knowledge necessary to control their own finances. "I saw that almost all the documentation was in English. Sometimes they didn't understand what they were signing," Rico says. The final portion of the day is by far the noisiest. Amid the sounds of drilling and hammering, the women use newly acquired vocabulary words ("Phillips head! Pass the Phillips head!") 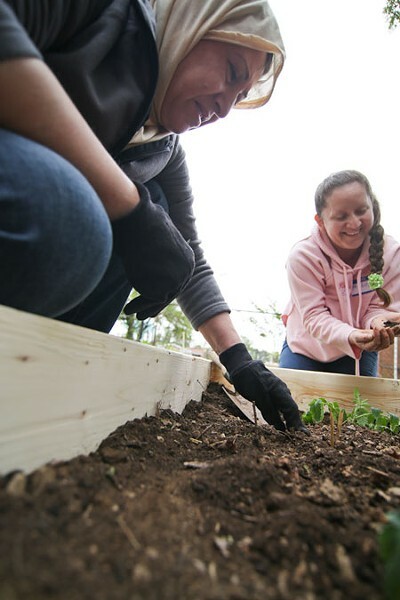 to build raised garden beds that they and other participants will eventually fill with vegetables, including squash, onions and tomatoes. They'll pick those vegetables and can them, if they choose, or sell them at a farmers market — Jerez says participants can do what they want with their produce. "Whether they stay here with us or go out on their own doesn't matter," says Jerez. "In essence, all the participants will be the owners of the nonprofit. We want people to come together and become self-sufficient." Each woman has her own reasons for joining SheCan. Mexican-born Maritza Vazquez was looking for activities she could do with her son, and also had a desire to learn English. "I have land to plant on at home and wanted to learn a more proper way of doing it," Vazquez says in Spanish. "I also like that I don't have to wonder where to leave my son while I come here and build toward my own income." Maria Luz Vasquez, also from Mexico, cites environmental concerns as her chief reason for participating. "The environment is deteriorating, and I want my kids to know more about it," she says. "When I was a girl, I liked to work with my parents and learn about plants, work with my hands. I want my children to have that experience as well." Jerez and Rico may spearhead the meetings, but information exchange is a two-way street. "I'm a learner, too," says Rico. "I'm just beginning to grow my own food, and I'm as committed to this as they are."